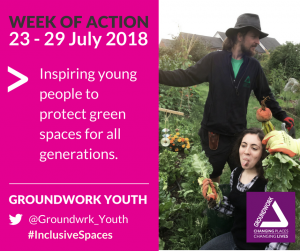 Groundwork has launched their Inclusive Spaces campaign, which aims to connect 100 of their ‘Young Green Ambassadors’ with 100 community groups across the UK. The charity will then support them to collaborate on local events raising the profile of our local parks and green spaces. The campaign kicks off this summer, culminating with a week of action during the week of 23-29 July 2018. Groundwork will then match you with a Young Green Leader in your area – or if this is not possible, provide you with the support to engage with young people in your area. The Inclusive Spaces campaign was developed through the charity’s ‘Groundwork Youth’ initiative, empowering young people and community groups to collaborate and work together to tackle the issues affecting the places where they live. Working closely with a dedicated youth advisory board, Groundwork has supported a network of young ambassadors to identify the biggest issues facing young people in communities across the UK. They found that there are far too many barriers to young people engaging in their local green spaces – with 69% of 16 – 24 year olds saying they would volunteer but only 7% actually did so, despite the deep concerns they have for their local environment. The group also found that 96% of Friends of Groups want to engage with local young people but 81% are also unsure of how to do so. Inclusive Spaces will bridge this gap by brokering relationships between the two groups and supporting them to take action together in their neighbourhoods. Inspired to take part? Check out Groundwork’s Campaign Resources here http://bit.ly/GwkInclusiveCG – and contact communities@groundwork.org.uk for more information on reaching out to young people in your area. Groundwork are providing Youth Engagement 101 Workshops to assist groups in learning more about engaging young people in green spaces projects. Find out more about them here.